BETHESDA, Md., January 15, 2019 /3BL Media/ – Lockheed Martin is now accepting applications for its new 2019 Lockheed Martin STEM Scholarship program through Tuesday, March 12, 2019. The U.S. Bureau of Labor Statistics projects the demand for aerospace, electrical, mechanical and computer engineers will grow 16 percent by 2022, which means that 1.5 million jobs will need to be filled in that timeframe. The Lockheed Martin STEM Scholarship program provides opportunities to students who want to build their STEM talents and change the world. The program is open to high school and college undergraduate students planning to pursue a major in engineering or computer science, who demonstrate financial need and come from underrepresented or underserved communities. Beginning in 2019, Lockheed Martin will award 200 scholarships of $10,000 per student, and it is renewable each year. This program has significant scale with up to 1,000 students each receiving $10,000 annually. When the program is running at full capacity, Lockheed Martin will be awarding $10 million in scholarships annually. This scholarship offers much more than money, mentoring and internship opportunities are a key component of the program. 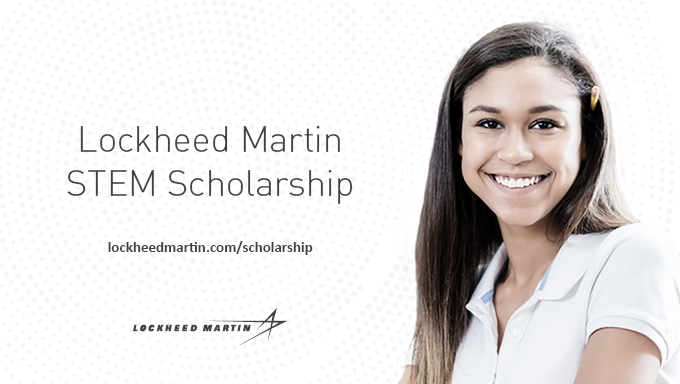 To see detailed eligibility requirements and apply, visit https://lockheedmartin.com/scholarship. Application, questions and additional information about the program can be answered by Scholarship America. Please share out the opportunity with the students and educators in your life!